New York, New York – Ameringer | McEnery | Yohe is pleased to announce an exhibition of works by Wolf Kahn. The City As Landscape will open on 12 July 2012 and will remain on view through 17 August 2012. A reception for the artist will take place 12 July, between 6:00 and 8:00 PM. The public is welcome. 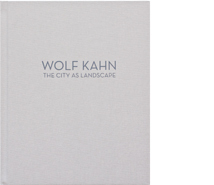 Kahn’s work may be found in public collections including The Metropolitan Museum of Art, New York, NY; Whitney Museum of American Art, New York, NY; Museum of Modern Art, New York, NY; The Jewish Museum, New York, NY; The Museum of Fine Arts, Boston, MA; The Hirshorn Museum and Sculpture Garden, Washington, D.C. and The National Museum of American Art, Washington, D.C.
Kahn is a member of the National Academy of Design and the American Academy of Arts and Letters and the recipient of numerous awards including a Fulbright Scholarship, a John Simon Guggenheim Fellowship and an Award in Art from the American Academy of Arts and Letters. The artist lives and works in New York City and Vermont.